Well, Spring has sprung. April will be here tomorrow!! The temps are in the 70's today .... crazy!! And, I've finally been able to get outside for some of my runs (I'm a wimp!). We visited Orlando this month and I took a few days off while we were there, but also got in a 4 mile run around the resort and then my half marathon. I had hoped to run more while we were on vacation, but Disney is an exhausting place and we are just go-go-go. But, I figure we walked 6-10 miles a day around the parks each day. Way to work off those Mickey ice cream bars, huh?! I transitioned from half marathon training to Marathon training this month. My longest run this month was 18 miles. Overall, I'm pretty happy with the amount of miles I got in during the month of March. Total rest days in March: 11 days (5 at home, 6 on vacation at Disney World). Just Call Us "The Bondi Band Family"
Yes, I am OBSESSED with Bondi Bands. What started as "trying one out" at the 2008 Chicago Marathon Expo, became an obsession. And, they have kind of become my trademark. So many of YOU love them and why not? They are fashionable AND functional. Once I chopped my hair off after Little Dude (kid #2) was born (I got about 18 inches of long locks cut off -- ouch), I was looking for something to replace my baseball cap. I wanted something that kept the sweat out of my eyes (I always had a problem with my eyes burning after a long run; even with hats) and something that kept my hair from bouncing around. My hair was too short to pull back or even the sides up. Bondi Bands were an awesome discovery for me. Now I have a huge basket full of them in our home gym. 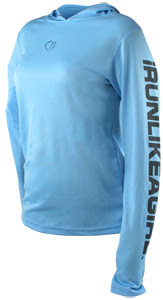 I almost always have one to match my running outfits. I even try to match when I'm doing all of my solo treadmill running downstairs on the dreadmill. Yep! They are fabulous and ALWAYS stay in place for me. The fabrics can differ from style to style. But, I haven't had a problem with the different fabrics. Anyone want to do some early Mother's Day shopping for me?!?!?!?! Start shopping here. It's gotten so bad that Little Dude (age 2) always has to sport them when I'm working out. We saw Rebecca's booth at the Disney Princess Half Marathon Expo and he yelled, "Bondi Bands" in excitement!!!!! In the first photo, I'm sporting this awesome Marathon Mama ringer that I purchased last year off of Cafe Press. You can snag it here. Girls on the Run RAFFLE & FUNDRAISER for the Little Runners!!! Growing up, I (believe it or not!) was completely shy when it came to trying new things. I didn't really do sports, extra-curricular activties and absolutely hated gym class. I was always scared to try something new and hated the end of the school year because we had to run the mile (I really laugh at that now!). I continuously took one dance (jazz) class a year and was passionate about practicing in my bedroom and having friends over to make up routines with spotlights (flashlights) on us in the basement. I never had an interest in trying something new or getting out of my comfort zone. I never wanted to try anything new and my parents didn't push me to. And, that is just fine. But, I wish I would've discovered other things. I mean, what could I be really good at, but never gave it a chance?! This is why I try to get Little Diva involved in all sorts of activities. Despite what some people may think, I have never pushed her into anything ... especially running. She gets a thrill out of participating in activities ... and making new friends at each stop along the way. We've tried running, piano, hip-hop, swimming, karate, gymnastics, mommy-and-me yoga, t-ball and drama class (just off the top of my head). I figure if I can get a cheap rate for a 6-8 week program, she can give it a try. We aren't committed to anything and if she doesn't like it, we can try something else. This is why I love Girls on the Run. I have been passionate about the Girls on the Run Organization for quite some time now. I just love what they do to motivate young girls and young women to get active, believe in themselves and build confidence. I think it's totally awesome that I can get passed by a nine year old little girl that's clomping her feet along a 5K course -- more power to her!!! To educate and prepare girls for a life time of self-respect and healthy living. This is why I have decided to run as a Sole Mate for the 2010 Madison Marathon on May 30th. If you are interested in making a donation to the GOTR program, you can do so here. THANK YOU!!!! Still, thinking about it?!?! Well, you may be serious after you see what's in store for you below. 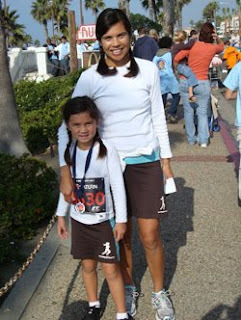 You will work with Running Skirts to grab your own mommy-and-me running skirts outfit!!!! 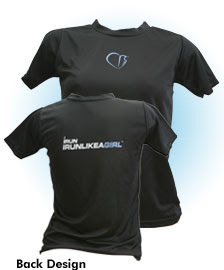 You will work with I Run Like a Girl to snag your own YOUTH I RUN LIKE A GIRL SHIRT! There are soooooo many ways to win!!!!! (#1, #2 and #3 below). inspire a little girl to believe in herself today!!! Contest ends on Saturday, April 10 at midnight. The winner will be announced on Sunday, April 11. Recovery Socks are so popular right now and are pretty affordable compared to the other compressions socks I've seen. They come in the standard black, white and grey, but are also offered in fucshia and lime green. Hmmmm ... do I have a running skirt to match these?!?! This cute fucshia pair is sweet and they are exactly what I snagged to review were only listed at $34.90. Recovery socks claims that they are a graduated compressions sock. They are supposed to enhance and stimulate circulation in your lower legs. You can wear Recovery Socks during a long training run to keep your legs fresh or aftwards during recovery. They are also great for long airplane rides and traveling. They claim that they will boost your performance, improves oxygen delivery to the muscles, stimulates blood circulation, reduces leg cramps and stiffness and will reduce lactic acid production in your legs. They are made of a wicking and antibacterial fiber (we're all so technical, aren't we?!) and were tested on World Class endurance athletes. I've worn my Recovery Socks three or four times already. Once on my recent 18 miler and the others on shorter treadmill runs (3-4 miles). I also wore them once AFTER a workout, to see if I'd feeling any different during recovery. Little Diva is the best lil photographer these days!! They were great for my long outdoor run, because the weather was somewhat cool, and the socks kept my legs warm. When the sun came out and things heated up over the next three hours, I didn't overheat, as I feared I would with these socks. They kept me at the right temperature. I was worried that they may shift or fall down, but they didn't. I also have "thicker" legs then other long distance runners and they seem to fit me just fine. They may not look as sleek as they would on some of you, but they fit just fine and didn't need adjusting as I ran. Now that I look back to last weekend, I didn't feel sore the next day after running 18 miles, didn't have trouble walking down stairs or anything. I'm not sure if this was due to the Recovery Socks or not. But, they sure didn't hurt the training run. The first time I wore them was on a 5K treadmill run and I felt the biggest effect during that wear. My legs felt a bit tingly which kept my mind entertained during my workout. They are also super cute, as some of you are really getting into the knee-high socks craze right now while running. As much as I love being matchy-matchy and sporting cute running outfits, I wonder if others out walking during my long run just thought I was trying to be "cute" rather than testing out some "compression socks". Oh well, I guess that's multi-tasking!! Check out what other athletes are saying about Recovery Socks here. You can pick up your pair of fucshia recovery socks and two Recovery Socks headbands here in my huge giveaway. If you haven't entered already, why not?!?! Check it out, you can sponsor me in my marathon for the Girls on the Run Program and you can try out a lot of great products!!!! Check it out, check it out, check it out ...... (If you're daughter watches Sonny with a Chance on the Disney Channel, you'll get that one -- We love Demi Lovato!!). Entries are being accepted until midnight on Thursday, April 1st! My Triathlon Jewelry has something for everyone, whether you are a runner, cyclist, swimmer or triathlete. They offer several unique items, jewelry, key chains, christmas ornaments and gifts. They also offer custom medals. Everything they sell is made in the USA. First of all ... Everything on their website is super affordable. All items are pretty much listed for under $10 a pop. You can't beat that! Start shopping now at http://www.mytriathlonjewelry.com/index.htm. I chose to review this simple 26.2 pendant on a beaded chain. I have only competed in one marathon this far and am currently training for my second. But, I have been wearing this proudly (just like the 26.2 sticker on my minivan!!). No matter how many times you've completed the 26.2 mile journey, you are a member of the club and deserve to show others that you've completed the mileage proudly!! I liked how simple this necklace was. I recently wore it on a "mommy day', bumming around town with Little Dude and even had a store clerk as me which marathon I competed in. I was shocked that she even knew what 26.2 miles meant, until she told me that she has completed three marathons. Then, of course we sparked up a conversation about running and our addiction. It's amazing how runners can connect instantly. I also had a neighbor ask me the very same day which marathon I'm training for now ... not sure if she understood the meaning of the necklace or she just thinks I'm obsessed?!?! Looking for a great holiday gift a few months down the road? They also sell really adorable ornaments related to endurance sports. I can't wait to decorate our christmas tree with one or two of these bad boys! Anyhow, My Triathlon Jewelry is a great way to show your accomplishments in a simple ... and fashionable ... way. Whether you run recently ran 13.1 miles in your first marathon or train for 140.6 miles in an Ironman competition, there is something for you. You have the chance to win this awesome I Love Running Necklace here in my HUGE giveaway. If you haven't already entered, please do. It supports a great cause!!! Giveaway ends Thursday, April 1 at midnight. GOOD LUCK! This is a friendly reminder that there are still two days left for my HUGE GIVEAWAY benefiting the Girls on the Run Organization here. Enter now through midnight on Thursday, April 1st. I love the Girls on the Run Organization and I have signed up to be a Sole Mate for the 2010 Madison Marathon ad needed to raise $262 (yes, resembling 26.2!!) by the race on May 30th. YOU ALL HAVE ALREADY HELPED ME RAISE $270 AND I HAVE ALREADY EXCEEDED MY INITIAL GOAL!!!!!!!!!!! THANK YOU!!!! You can visit my donation page here to donate and receive extra entries. Your contribution will benefit the Girls on the Run's Dane County (Madison, Wisconsin) Chapter. *** Another giveaway will be posted this weekend, featuring other amazing products from other amazing sponsors. Today is the first day of spring break for Little Diva, so both kiddos are home for "mommy day" today. Lucky me only has to work two days this week and will spend the rest of the time with the kids. After breakfast, we all headed downstairs for a 4 mile treadmill run. The kids actually love coming downstairs and spending time together. I loaded them up with some goldfish and pretzels and we watched Super Nanny. Little Dude was very concerned about the little 2 year old boy that wouldn't go to bed. I asked him if he reminded him of anyone. Little Diva's photography work of me with my standard after run Diet Mountain Dew. And man, I really would love to get this lower-level finished off ... so sick of running next to insulation. Little Diva and Little Dude always have fun with the exercise ball and yoga mat. They also had a blast (as always!) playing with diaper boxes and blankets and making forts. i don't know how they squeeze themselves into those tiny boxes?!? The rest of the day will be fun for all ... spending holiday gift cards at Build a Bear and Target. Because, we need more toys, right?! Then if it's warmer this afternoon, I hope to get them out to one of our favorite parks and a Subway picnic. If you workout with your kids, what do you do to entertain them and keep it fun??!!! I look forward to hearing your suggestions. So, I woke up today and had a 12 miler ahead of me. Hubby also had about a one hour run on tap and we had a family gathering about 40 mins away from home in the afternoon. He ran in the morning while I cleaned up around the house, did stuff with the kids and got them ready. We spent the afternoon with family outside, in the garage. We weren't prepared, so many of us didn't dress appropriately. The forcast was for low-50's today, but it was windy and turned out to be quite cloud-covered. Everyone was chilled. We got home around 5pm and I still had a 2 hr run ahead of me. I decided to put Little Dude down for a late nap, Little Diva in front of the tv (she was outside all day and playing with my little cousins, so I didn't feel too guilty) and hubby was ready to zonk out on the couch. It's amazing what the weather and cold can do to a person. I hopped ont he treadmill around 5:30 pm. I had made my own version of G2 (low-calorie Gatorade). I've gotten sick of sticker-shock from the individual G2 bottles they sell and even the packets they now sell similar to Crystal Lite. Hubby buys the huge powder packets that last us a long time. Now, they last us even longer because I do about 1/2 Gatorade and 1/2 water. I consumed both bottles, a Crank Sports e-Gel (which I love!) in Cherry Bomb flavor (like a chocolate covered cherry!) and a pack of the new powerBary Energy Gel Blasts in Raspberry flavor. I cranked the 1980's box-fan that I enherited from my parents and watched almost two hours of realtity tv (MTV's Teen Cribs, True Life and then Ruby on the Style Network). I like the Crank Sports e-Gels because they are bigger than other gel packets, which also results in consuming more calories. But, I love them. 150 calories in a 1.9 oz packet. I get a bigger burst of energy obviously. This was my first time trying the PowerBar Energy Gel Blasts. I wasn't sure what the consistency would be like or what they really looked like from the package. Here is what one looks like and one that is bitten into. They are gummy like the other chewy products out there right now, but have a "liquid" center which was good. But they aren't really "squirting" with fruit flavor like the picture shows. But, they were yummy, easy to chew and gave me a burst of energy. 190 calories in the pouch and there were 9-10 pieces in the pack. I tried to take two about every mile or so, after the third mile. This way I don't ever "lose" energy and feel too incredibly faint. I would try them again. So, I planned to stop at 10 miles and got it done in 90:03 (Gosh, I really hate that my treadmill flashes back-and-forth between distance and time. It really does drive me crazy.). Not too shabby, eh?! I drank some G2, and headed upstairs for a quick potty break and then started her up again for the last 2 miles. I tried to crank it a little, just to get done and my stomach was starting to upset me. But, I plowed through the last 2 miles in 17:12. After workout "glow" ... gotta love that feeling! The winner of my Gu Giveaway is Sunflower Kisses. Check out her blog. She is a new runner that is training for her first marathon in Nashville! Good luck! Email me your address and to claim your prize!!! CONGRATS on winning ... and taking up running!! To celebrate my 100th post, I mentioned awhile back that I would be hosting a HUGE giveaway ... well, I am delivering. I've received so much response from my awesome and generous sponsors, that it has taken me awhile to get it all together, after returning from our family vacation. I love the Girls on the Run Organization and I have signed up to be a Sole Mate for the 2010 Madison Marathon and need to raise $262 (yes, resembling 26.2!!) by the race on May 30th. You can visit my donation page here to donate and receive extra entries (as mentioned at the end of this post). Your contribution will benefit the Girls on the Run's Dane County (Madison, Wisconsin) Chapter. THANK YOU!!!!!!!!! DID I GET YOUR ATTENTION???!!! There are so many ways you can win and one required entry. SEVERAL PRODUCT REVIEWS COMING SOON!!! 14 - DONATE TO THE GIRLS ON THE RUN ORGANIZATION (that I love so much). I have signed up to be a Sole Mate for the 2010 Madison Marathon. I need to raise $262 by May 30th. You can visit my donation page here. Contributions will benefit the Girls on the Run Dane County (Madison, Wisconsin) Chapter. Every $5 donation will receive 5 entries into the giveaway. If you donate $10 you will receive 10 entries; and so on. If you do decide to donate, please LEAVE ME A COMMENT (and include your "real" name, so that I can match it up with a donation listed on my donation page. So, post away and donate until your little heart's content!! The giveaway will end at midnight on Thursday, April 1. The winner will be announced on Friday April 2. GOOD LUCK!!!! $5 Race --- SIGN ME UP!! 300 miles down -- 1,100 to go!! Rockin' the Jogging Stroller -- Yeah!